First Line: Steam seeped through the airholes in the Angelo's pizza box, along with the aroma of melted mozzarella, pepperoni, sauce, and spices. Having a boyfriend who owns a pizza place has its perks, although Katie Bonner is secretly getting rather tired of pepperoni. And whenever she walks into Artisans Alley and looks across the square to the old Webster mansion, she feels a twinge. If her late husband hadn't invested all their savings in the craft mall, the Webster mansion would have been hers to restore lovingly and turn into a bed and breakfast. 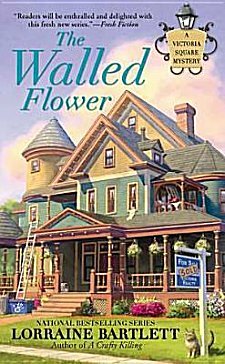 Now her dream has become Janice and Toby's, but the new owners have barely started demolition when a skeleton is discovered sealed in the walls of one of the rooms. The bones are identified as those of Heather Winston, a young woman who's been missing for over twenty years. Heather's aunt, Rose Nash, works at Artisans Alley and asks her friend Katie to help her find Heather's killer. The two women soon find out that the killer is very much alive and really wants past secrets to remain buried... at all costs. This second book in the Victoria Square cozy mystery series continues with a setting and a cast of characters that I greatly enjoyed in the first book, A Crafty Killing. The setting allows for an interesting mix of characters with all the artisans and crafts people renting space in Artisans Alley. Through Katie we can also learn about merchandising, advertising, and being a member of the Merchants Association. There's much more meat on the bone in this series than just a mystery to solve. Although I deduced the killer's identity rather early on, I settled in to watch how Katie put the clues together. Spending time with Katie and her friends on Victoria Square is a very pleasurable way to spend a few hours, and I intend to keep on doing it. Cathy - I can see why you intend to. That premise allows for an interesting set of possibilities for story arcs and new plots. Methinks I may want to check this out. I like the sound of this one. I'm always on the lookout for good cozy series!